Favourites with Kitchen Garden students, these muffins are child's play to make. 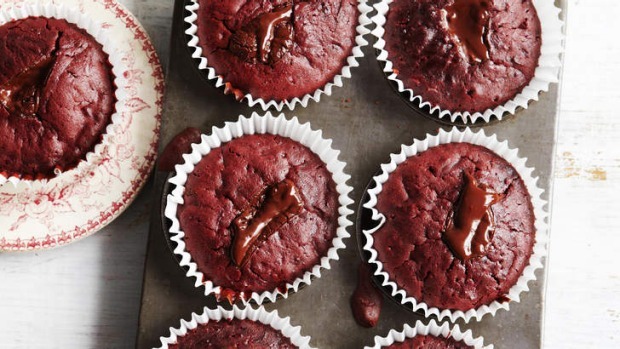 These treats can be made with cooked beetroot instead of raw - both are delicious. Lightly grease a 12-hole muffin tin, or drop paper cases into the holes. Peel beetroot and grate in food processor with grating disc. Set aside and wash processor. Sift flour, baking powder and cocoa into a large mixing bowl. Process butter, oil and sugars until creamy. Gradually add egg/milk mixture, alternating with flour mixture. Tip into the large bowl and stir in beetroot. Mix well. Spoon mixture into muffin holes. Break chocolate into 12 pieces and poke a piece into the top of each muffin. Bake for 20-25 minutes until well-risen and springy to the touch. Cool in tin for a few minutes then turn onto a rack.